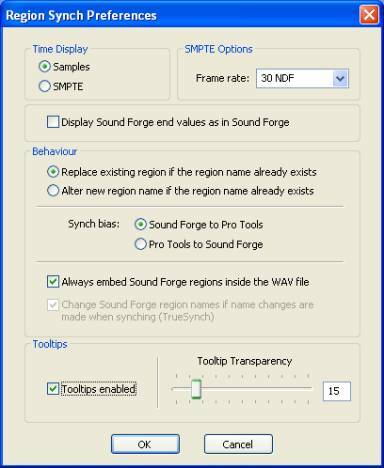 Region Synch will allow you to transfer region definitions between *Digidesign Pro Tools® and **Sony Sound Forge® and other applications which support the Sound Forge region definitions (see below for a list of compatible software). See Application Tips below. Press the Open button and the user may select one or more WAV and/or AIFF sound files using the normal Windows convention (the Shift and Control modifiers may be used to select multiple files). Press the Select button once the selected files are highlighted. Selecting a Sound File in the list will display any Pro Tools and Sound Forge Regions associated with the sound file. You may drag regions from either list to the other and the regions will immediately be updated. 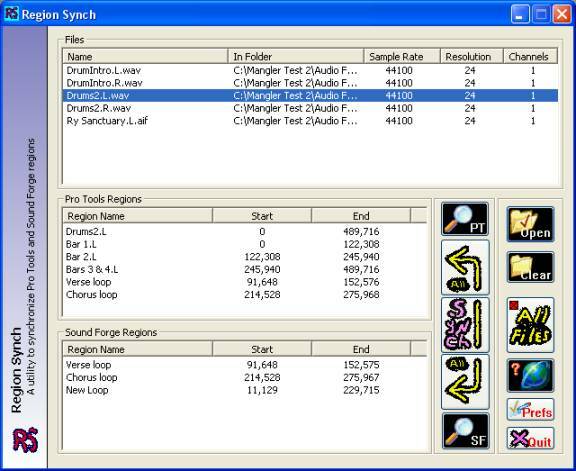 Sound Forge allows the region definitions to be either embedded inside the sound file or in an associated SFL file – when adding Sound Forge regions, Region Synch will default to creating an SFL file unless there are already existing Sound Forge regions definitions embedded in the sound file. You can change the preference so that the Sound Forge region definitions are always embedded in the sound file. Pro Tools region definitions are always embedded in the sound file. Pressing any of the buttons to copy or synch regions will perform the copy on all files in the Files list. The region will be immediately updated when you click on the OK button. Regions can be deleted from either region list simply by selecting them and hitting the Delete key. The regions will be immediately deleted. The First Pro Tools Region can’t be deleted unless all regions are deleted. See the topic The First Pro Tools Region below. This function will recombine stereo split mono audio files into a single stereo interleaved audio file and keep the region definitions. This function will separate a multi channel interleaved sound file into multiple mono audio files and keep the region definitions. Select to Interleave or Split an audio file by right clicking on the file name in the File list. The menu options will be available only if the option is applicable. Right click on the region definitions to open the Import Region Definitions dialog – the regions will be imported into the currently selected sound file. If the region data is beyond the data of the currently selected sound file... it will be disabled/grayed out. Check the check boxes for all regions you wish to import the definitions and then press the Import button. Press the same button to shrink the region list back to the original size. Pressing this button will open your web browser and bring you to this document. This option allows the user to change how the start and end times are displayed in the region lists. They are display only options and don’t affect the actual regions saved in the audio files. Sound Forge lists the end value as one sample shorter than the length of the region.. this option is available so that the values in the Sound Forge region list will match the values as they’re displayed inside Sound Forge. The user has previously synchronized the regions so the sound file contains the same region names for both applications.. but they’ve changed the length of one of the regions in Sound Forge… if the bias was set to Pro Tools the Sound Forge region would be set to the original values as still exist in the pro Tools region list… if the bias was set to Sound Forge the Pro Tools region would be set to the new Sound Forge values. This mode is an option that leaves existing region definitions intact. This mode does not achieve true synchronization. 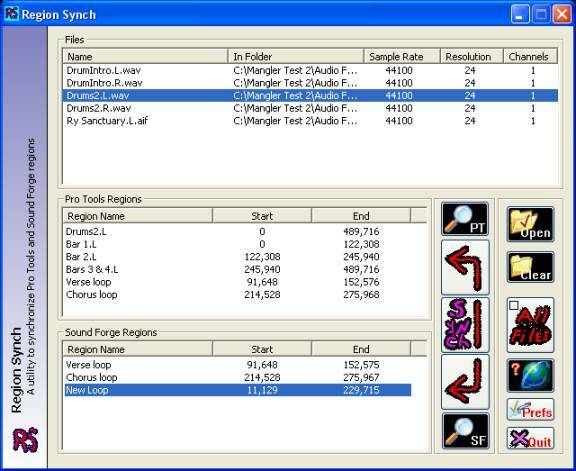 By default, if there are no existing Sound Forge regions embedded in a sound file and no SFL region list file is associated with the sound file, then Region Synch will create an SFL file. When this option is selected new Sound Forge regions will always be embedded inside the sound file. Tooltips enabled This option enables or disables the tooltips. Pro Tools only allows region names to be 31 characters long... when copying or synching regions if the names are longer than 31 characters they’ll be altered automatically so they don’t exceed 31 characters and they don’t cause the region name to be duplicated. Note: Your Sound Forge region names will be truncated to fit the Pro Tools spec. The first Pro Tools region definition must be named the same as the sound file and be the length of the complete sound file – when the user copies Sound Forge regions to a sound file with no Pro Tools region definitions.. this special first region will be automatically created. If the currently selected sound file is changed externally it should automatically update in Region Synch to show those changes – so if the user added regions to the current sound file in either Pro Tools or Sound Forge and saved the file the changes should be immediately available in Region Synch. To export region definitions so that they’re embedded in a sound file in Pro Tools, select the regions and in the Region List menu select Export Region Definitions or use the key command Control+Shift+Y (on a Mac Command+Shift+Y). To sequence a CD, Bounce To Disk the complete sequence in Pro Tools and import the bounced stereo file into a Pro Tools session. Separate each song into a separate region. 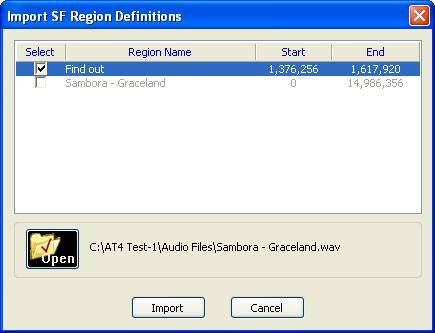 Export the region definitions into the sound files. 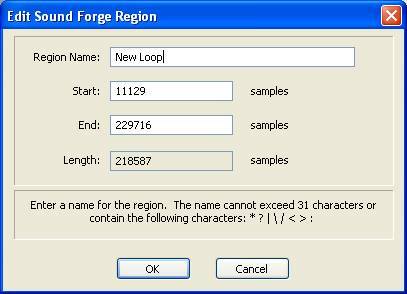 With Region Synch convert the region definitions to Sound Forge definitions. 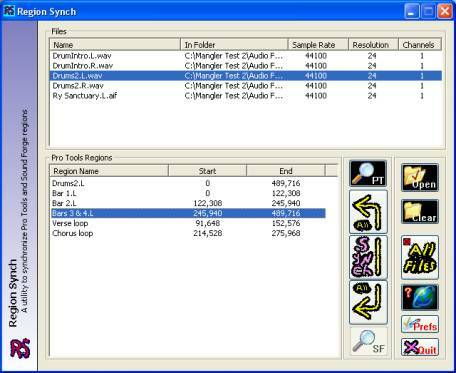 Open the sound file in your CD burning application and use the region list to lay out your CD sequence without having to export each song as a separate sound file. To use a DirectX plug-in that you don’t have in Pro Tools – select the phrase and export the region definition. Open the sound file in your application that supports DirectX and process the plug-in back to the sound file. For many applications you can save time and disk space by not needing to export a single large sound file as many smaller sound files for batch processing in another application. Simply create the regions and synch them in Region Synch and open the parent sound file and work with the region definitions. It’s common practice to share sessions between application and platforms by bouncing each track as continuous audio from Bar 1 Beat 1 of the song… but by doing so you lose all region definitions from the source application. By exporting region definitions with the consolidated sound files the person receiving the sound files will have the same region definitions as in the original session. ** Sound Forge®, Sony Vegas® and Sony CD Architect® are all trademarks or registered trademarks of Sony Pictures Digital Inc. or its affiliates in the United States and other countries. Adobe® Audition is a registered trademark of Adobe Systems Incorporated in the United States and/or other countries.